We speak with famed explorer, author and sustainability campaigner Jason Lewis about travel, adventure, and the meaning of life. Jason Lewis was always destined for the adventurous life. He recalls that from an early age he struggled to imagine himself in a desk job – though ironically, in his latest incarnation as an adventure author, that’s exactly where he finds himself. He notes that in the UK, social and family backgrounds still play a large role in people’s career paths, political views – even dress and relationships. He found this “incredibly claustrophobic,” feeling an urge to defy the expectations of his family and peers, escaping the “cold, wet, island called England” in order to “place [his] head above the parapet” and discover the reality of the outside world. Defining ‘adventure’ as “stepping off into the abyss of not knowing, taking a leap of faith” without any certainty of how a given situation will turn out, Lewis emphasises that this may not necessarily be a physical feat, but a mental, emotional, or metaphorical one: adventure is a state of mind. He reflects that in the comfort and predictability of the modern age, many of the challenges that defined the lives of our ancestors have disappeared, leaving us to seek out opportunities to find out just how much we are capable of against all odds. 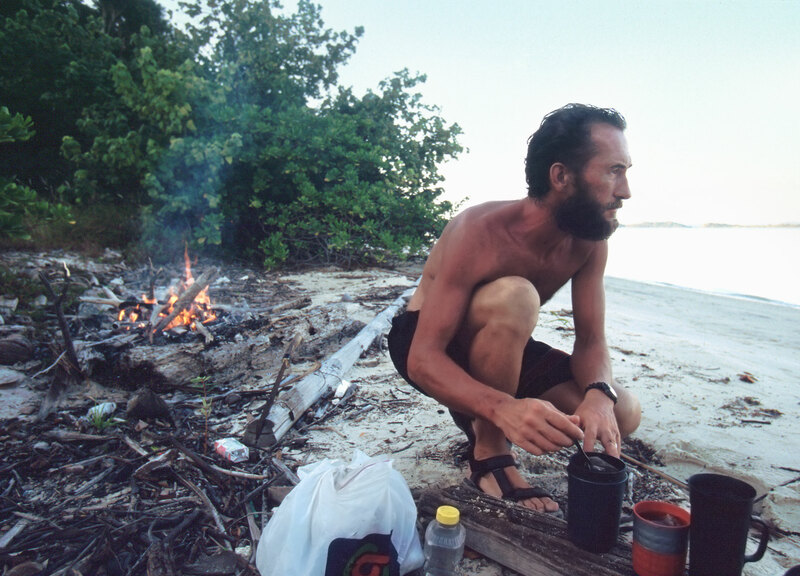 Lewis compares this drive of his to the preferences of many of his friends, who would never wish for the precarious “feast and famine” life of the adventurer. He believes there is a small percentage of the population that is genetically hard-wired to explore, while the large majority are happier with a more domestic life. He notes, “If everyone was back working the fields, we’d never know what was over the next mountain, as it were. And if everyone was out doing adventures, there’d be no one back home actually doing some real work!” We all have roles to play. Contemplating lunch in the Indonesian archipelago on Expedition 360. 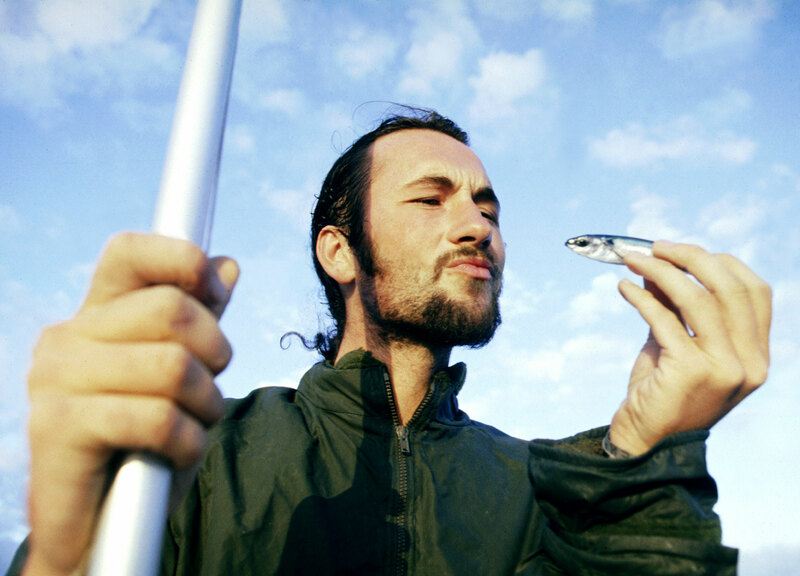 Expedition 360, Lewis’s life’s work to this point, was conceived of by his friend Steve Smith in 1994, who accompanied him on the first part of the trip before deciding the adventuring life was not for him. 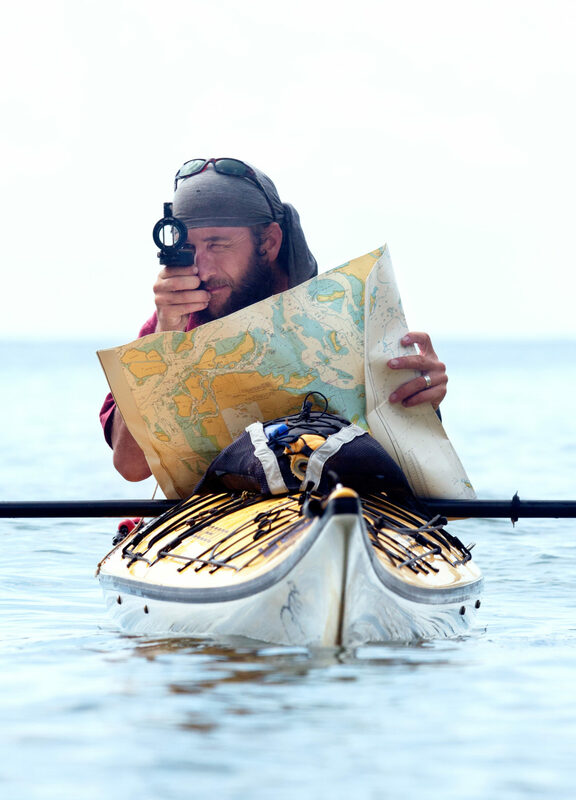 Smith came up with the idea of circumnavigating the globe by purely human power – walking, cycling, rollerblading, kayaking, swimming, rowing, and pedalling a boat all the way around the world. Lewis seemed to Smith a likely candidate for the task, as they’d spent their college years together taking off on crazy directionless weekend jaunts outside of London. He knew all about Lewis’s “wanderlust spirit.” At the time, Lewis was bored with London, “just limping along,” so he agreed, citing the simplicity of the idea as the main attraction. Plus, it was only going to take three years – or so Smith said. Thirteen years later, Lewis had experienced many amazing places, all under his own steam. One of his most memorable experiences was paddling his kayak through Komodo National Park in Indonesia, which he describes as “just magical” due to the lack of people, incredible sea life, white sandy beaches, fascinating flora and fauna, and the prehistoric-looking topography of the islands. Lewis also loved Tibet, feeling that he had travelled through a part of the world that was in the process of becoming something very different as a result of Chinese rule and international tourism. Northern Sudan was another favourite: he fondly describes riding his bike up the side of the Nile, coming across ancient temples and statues and exceptionally hospitable people. He had also done a lot of growing up in the decade or so since leaving London. Aside from the challenges of malaria in Indonesia and in Laos, blood poisoning partway across the Pacific, and dysentery in Ethiopia, he faced his own mortality in more direct ways on multiple occasions. The first of these was a near miss with a trawler on the Atlantic Ocean, while 200 miles south of Portugal rowing to Miami. Completely unprepared to find a massive ship bearing down on him, Lewis panicked and froze – fortunately, the boat slid by just a few feet away. Following this up with a near drowning on the same leg and being run down by a drunk driver while rollerblading across Colorado, Lewis says he managed to get a better handle on living on the edge. In order to get through these tough times, he found the key was to maintain a focus on his reasons for undertaking the trip. Waking up in hospital in Colorado, he realised being ‘first’ was not enough – he had to have a better reason for doing this. From there, the trip took an educational focus, with Lewis getting involved with local schools developing cross-cultural and environmental education programs. He notes that the bravado of a young man, who thinks he’s indestructible, can actually be an advantage when exploring. He says, “when you suddenly become hesitant with what you’re doing, and you’re looking over your shoulder, that’s when I think things can go wrong. And that’s probably the time to hang up your crazy adventure shoes and do something a bit safer.” Has he reached that point yet? “I’ve been incredibly lucky so far. But I don’t want to push my luck.” Now that he has come out the other side, he feels lucky in that he no longer feels he has anything to prove: “I feel quite at peace with myself, and quite at rest, and I have a better appreciation for every minute that I’m alive on this planet.” He appreciates that might sound a bit clichéd, but it has spurred him on to do something useful with the lessons he has learned. A whole new ‘expedition’ began with Lewis’s homecoming in 2007. He struggled to find his feet initially, feeling “like a ghost, haunting the old places that [he] used to know” while everyone else had moved on. Reconnecting was a challenge when friends and family didn’t really understand what he had been up to, while Lewis had no idea about this X Factor business everybody seemed to be talking about. After a false start with a book deal gone wrong that left him living out of his car in California, Lewis unpacked the 44 journals he had amassed during the trip and began the mammoth task of writing the trilogy recounting his epic journey – The Expedition: Dark Waters, The Seed Buried Deep, and To the Brink. Lewis reflects that this process helped him to work through his motivations for setting off on his expeditions in the first place. He believes he was searching for a better understanding of what he should be doing with his life on this Earth, and realised that his subsistent existence within the closed system of the little boat out at sea was a miniature metaphor for how life could be on our planet. Lewis feels that from this experience he has gained the tools to live out his life as a more responsible world citizen. Lewis acknowledges that many ‘firsts’ have already been achieved, leading to crazier and crazier expeditions. With money being no object, he identifies the deep ocean and outer space as remaining “the final frontiers.” Otherwise, Lewis suggests that we just have to be more creative: it’s less about planting a flag on an undiscovered region or breaking a record, he says, and more about targeted expeditions that seek knowledge useful to wider society. Adventure is not out of reach for us regular folk, either. We can create our own unique expeditions that bring back alternative perspectives that help us to be more tolerant of others and more aware of issues in other parts of the world. The philosophy is that despite our surface differences, people all over the world have far more in common than not. Lewis recounts how – even in those destinations the safe travel organisations would tell us to avoid for the sake of our lives – he had “the most unbelievably positive experiences” with locals. In this way, he argues, we almost have a responsibility to travel: to see and experience ourselves what these places are truly like. Further, we can use our adventurous spirits to consider the collective and individual action necessary in our day to day lives to solve our global problems, such as climate change and environmental sustainability. With outcomes like that, we say: let the next expedition begin.